I'll be linking up late to Vanessa's "Inspiration Friday" over at "Southern in My Heart" so go by there and visit! I hope you are enjoying this most joyous of seasons! These are so sweet! My mother had a couple of darling angel ladies like this when I was a girl. 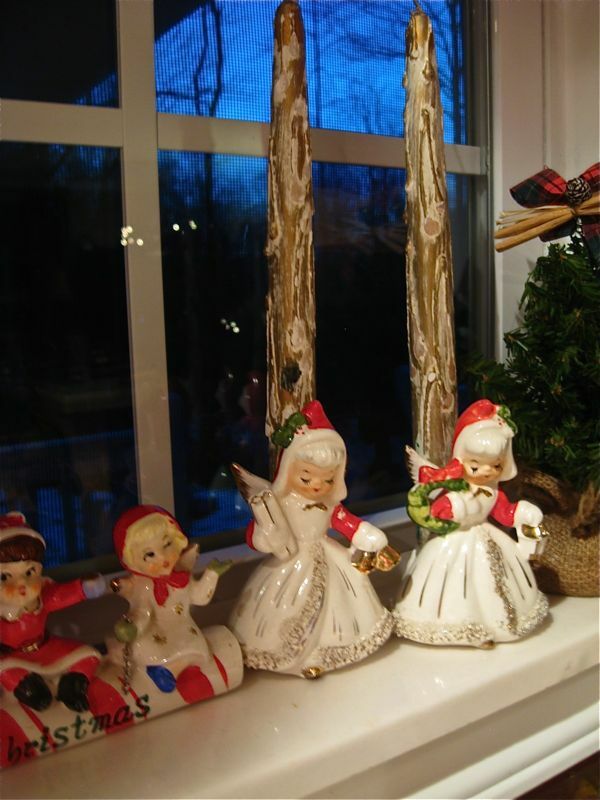 They were part of an old-fashioned angel collection that she kept lovingly displayed in her china cabinet. It was my job to carefully dust them, and I loved holding them and admiring the sweet little faces. What sweet memories of your Grandmother! I love your vintage pieces. There's something so quaint about them, don't you think? Thanks for sharing -- and Merry Christmas to you and yours! Hi! I'm visiting from Southern In My Heart. I love the angel decoration that belonged to your Grandmother. I'm sure you'll treasure it forever! What a treasure and wonderful heirloom. How lucky you are to have it! Hi Anita...boy it has been awhile since I have been over. So busy these days. Your treasures are beautiful and such a special reminder. Your vintage treasures are so cute and a nice memory. I really enjoyed your previous post, the light shining through your red glasses in just lovely. They are really nice Anita! I love that you have found that special place for them in your kitchen where I am sure you see them daily. I love the candlesticks too. They are so pretty! I love your little decorations and I think the memories that come along with them are priceless! Very sweet. I love decorations that have a memory attached to them - they're messengers from the past. Hi Anita,What beautiful memories of your Grandmother.Thank you for sharing. !Merry Christmas to you and yours! Hi Anita... just back for a little visit before I start my day! I really love vintage things. This season, I've purchased a few vintage linens through ebay. I took a second look at your pillowcase in the collage because it looks so similar to the ones I just got in the mail! I wanted to see your pretty front porch again, nestled in the Smokey Mts. Then, I noticed your little tree in the kitchen with an old Bible next to it. I think that's one of my favorite Christmas visions this season. sweet, sweet reminders of your grandma! What beautiful treasures...Merry Christmas to you and your family! Hi Anita! I love seeing your vintage treasures and I think it is so fun learning more about everyone's families. 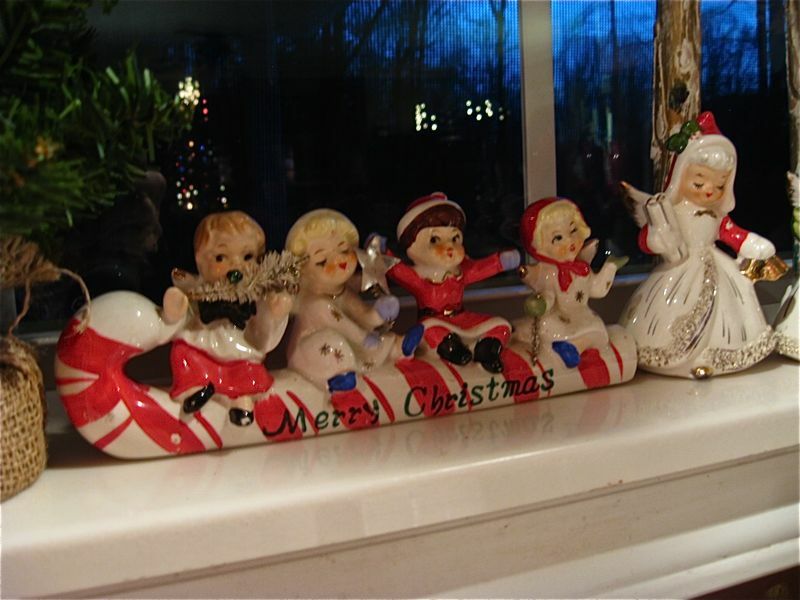 This time of year more than any other we seem to surround ourselves with those special things that conjur up memories of our loved ones and I know you have a deep appreciation for the history behind your beautiful decorations. Thanks so much for linking up to Inspiration Friday and if I don't make it back around again, I hope you have a very blessed Christmas! Those angels are so cute. And I've never seen those wooden candles before. Sweet. Oh Anita! Those are wonderful and how special for you to have those and have the wonderful memories each time you look at them! That is what I find so priceless! We just got back from Disney where we celebrated one princesses 5th birthday! I will be posting on that soon! I can't believe my baby is 5! I would love for you to pop over to my blog and see my dining room table! I used element from my neighborhood to create a centerpiece and I have to tell you that YOU again were my inspiration! As I was clipping from trees around the neighborhood, I kept thinking, "Anita does this all the time. I can do it!!!" I love how it turned out! I hope you have a very Merry Christmas and wonderful New Year!